Buy the Farm . 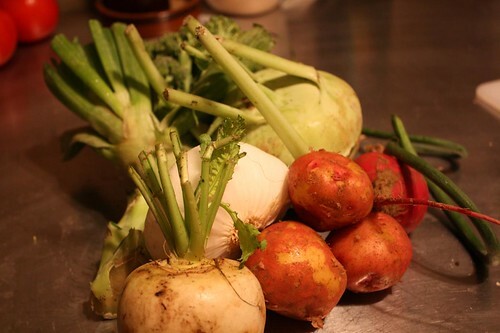 . . Share: It's All About The Vegetables, Baby! I had another day of feeling vaguely achey and gross. I think I have a touch of the H1N1. Maybe I'm just slightly ill. Once I got home I had a little tea and a snack and still felt gross. However, after a little pseudophedrine I was flying high! Is pseudophedrine just a fancy pharmaceutical term for magicks? 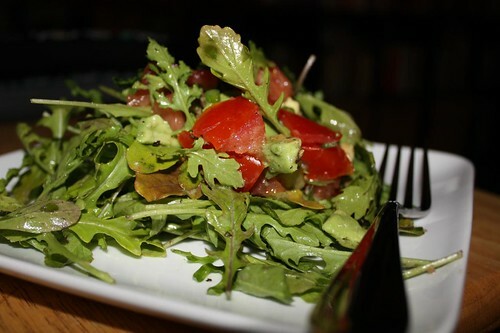 For a salad I tossed some arugula with avocado, tomato, lemon, and olive oil. Also, for good measure: some garlic scapes. I've got precious little time before leaving the state and a precious lot of vegetables left in the fridge. Combined with my recent mild mystery illness I opted for another night of soup. 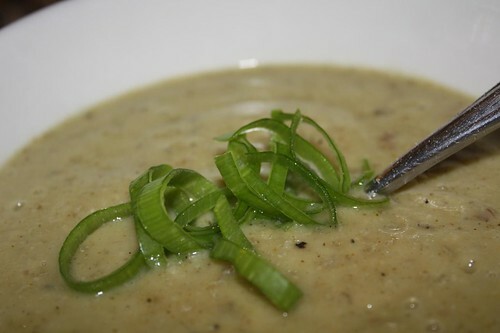 I used the farm onions, garlic scapes, turnips, potatoes, broccoli, and kohlrabi along with some sliced almonds, white wine, cayenne, cumin, and thyme to make the soup. The resulting soup was pretty darn good. I resisted the temptation to add any milk, cream or cheese and it turned out that it really didn't need anything additional. The only thing I would have changed was putting a little bit less cayenne in the soup. I have this incredibly potent cayenne pepper that I got a while ago. Each time I use it I use less and less but it just seems to be exceptionally strong, so much so that a scant quarter teaspoon in a huge pot of soup left me sweating afterward. I hate to talk about my own culinary brilliance, but I think adding the chopped almonds was a fantastic idea. Basically I'm as much of a culinary genius as Jacques Pepin for coming up with that idea. 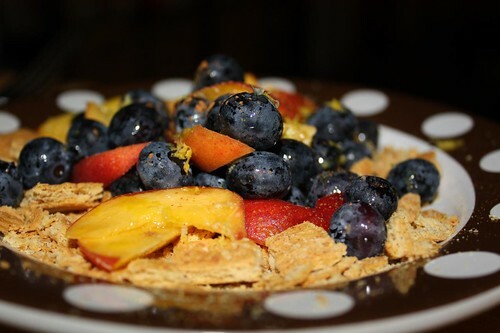 I realized that I'd worked myself into a vegan corner so, rather than break the trend, I made a vegan dessert with some blueberries from Dzen Tree Farms and farm peaches that I tossed in some lemon zest. The peaches were not perfectly ripened so I drizzled a little agave nectar on them and served it over crumbled graham crackers with a sprinkle of cinnamon. Nine times out of ten I will pick a chocolate-based dessert over a fruit-based dessert but this combination happened to be extremely delicious. It was just a bunch of stuff lying around in the pantry that "inspired" it but I think I stumbled upon a real winner. I may look at making again in a more composed form. Maybe I'll also top it with melted chocolate and whipped cream. Or crispy fried pancetta!